No matter what home you have, everyone has the same issue with the garage. There’s just never enough space to store everything you need to. A large chunk of the space will be taken up by your car, and the rest of the floor space can be covered with clutter as well as any bikes that you might own. This can make waking around your bike difficult, to say the least and leave it looking a mess. If you have too many items, you might even find that you have to leave your car outside on the path. This can leave what is no doubt an expensive vehicle in danger of theft, damage or wear and tear. It’s important to keep your vehicle inside and out of the elements. So, what’s the answer? You need to invest a good overhead storage rack of the garage. The best overhead storage rack will provide you with the floor space you need and ensure your garage isn’t a cluttered up nightmare. Here are some of the choices you can consider on the market. 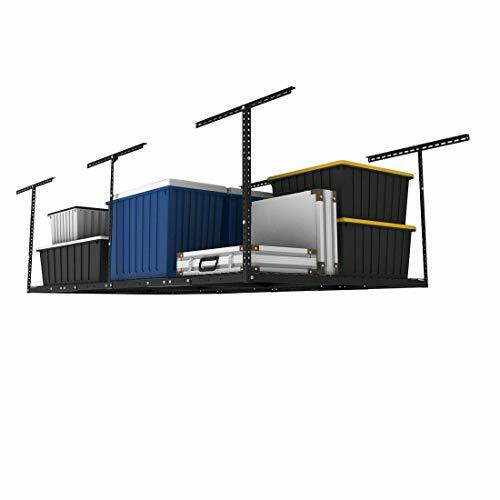 Fleximounts product solution is going to be a brilliant option if you’re looking for a piece of kit that can provide a lot of overhead storage space. In fact, you’ll be delighted to discover that this shelving can provide 105 cubic feet of storage. As well as being large enough for all your items, this shelving is build to last and offers easy installation options with a full youtube guide for the right set up. With an integrated grid, the system is designed to be a strong and sturdy solution. 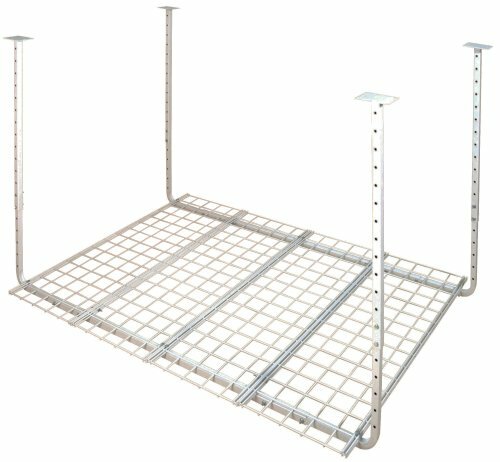 This system provides shelving that will hold 550 lbs of weight and can be used with a flat or angled roof. One of the best advantages of this system besides the size is certainly the ease of installation. All you need to do is secure the system with the holes provided, and your storage space will be up in no time. If you’re worried about sagging in the middle, you will also be delighted to hear that this system has a sturdy support bar to prevent the issue. SAFE - BUY Overhead Racks with LONG ceiling brackets designed to be attached to 2 studs. Combined with SIX vertical posts, it is the optimal structure choice to ensure safety. QUALITY - Top quality screw selected and All hardwares have gone through strict tests. Heavy duty cold-rolled steel construction provides safely loading up to 600lbs. DIFFERENT - INTEGRATED GRID DESIGN - More stable and sturdy compared to others with separate frame and wire. Though quite expensive, this overhead garage storage unit does use the absolute best material to ensure a long lasting solution. It can hold a tremendous 600lbs, and there is a full support center to help you fix it to your garage ceiling. Designed to provide industrial level strength the MonsterRax has a killer feature you won’t find on another products. You can adjust the height of the storage, and this means you can customize it to fit and store the items you need. As well as providing fantastic practical benefits, this garage rack also looks fantastic too. It will fit in well with the aesthetic of any garage. If you’re not keen on the idea of an installation, you can actually pay extra to get this sorted out for you and avoid any problems. The only issue with this product is that it doesn’t provide spare nuts and washers. However, this does make it a lot easier to keep track of the amount you need to fit the system to the ceiling. You know you’re getting a quality product when you buy the SafeRacks Overhead Garage rack because they provide a full lifetime warranty. The system can also hold 500lbs and has an adjustable drop length to suit your needs. 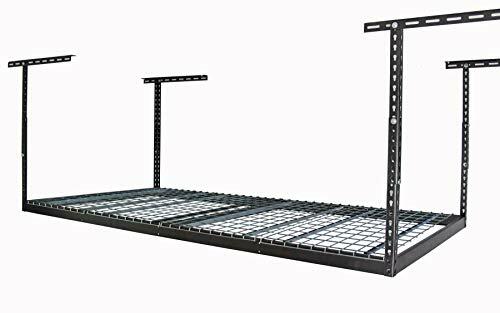 You might be worried about whether you can use a rack like this when you have a garage that doesn’t offer a level ceiling. Well, you’ll be pleased to hear that with some adjustments to the setup this won’t be an issue with this product. This product provides a great value but don’t let the price fool you. It’s a fantastic high-quality item and does provide a variety of extra pieces that you might need in case you lose or damage a few. A top installer can have this product up in your garage within just 30 minutes, and that means you can start storing things in no time at all. They are even large enough for multiple bikes. So, if you have a full family of cyclers, this could be the perfect solution for you with enough room for five bikes underneath. The system also provides a range of different options during installation. You can installed it parallel or perpendicular to the joints with no issues at all. Though offering a fantastic price this product is still more expensive than other options on the market, but it’s a stronger solution that you can trust to hold all your garage items. Smaller and indeed cheaper than most of the other options on the market, this budget-friendly solution is ideally suited for those who had modest storage needs in their garage. That said, the product still provides 35 cubic feet of space and will hold as much as 300lbs. This is certainly impressive for a system that’s on the market at such a low price. As well as this, similar to other products, this does provide you with option adjusting the height for your needs. That will help many people avoid the need for a ladder to access it. These systems are built to last as well with a scratch-resistant coating to keep it looking great for years. Unlike other options on the market, this does come with everything you need for installation. While it might not seem as sturdy as other options on the market, you can rest assured that it will hold, even with a lot of weight. You just need to make sure that the weight that you put on it is evenly distributed rather than being focused in one place. Another benefit is that you can use this product with Hyloft hooks. The product also comes with zip ties which can be used to connect it to other units that you might already have in your garage. You do get a good supply of additional hardware, just in case you accidentally damage or misplace any parts. This is the cheapest option on our list and provides a great small storage space that is light and easy to install. It offers an adjustable height of between 16 and 27 inches and despite the size can still hold up to 250lbs. The system can be used on drywall with a wood stood. It’s a great choice for clearing up the clutter in your garage that you only need to use once a year such as the festive decorations. The system offers an easy choice for installations as well, due to the fact that the poles aren’t welded brackets. You might not be much of DIY fan, but you don’t need to be with this solution. Instead, you can use the instructions that come with it to have the product up and secure in minutes. Ultimately, if you want a terrific space saver, then these racks are definitely for you. With the low price, you don’t need to stop at one either. You could buy a few and complete your garage with these great shelving options that look good too! ● Can be used on various different services. 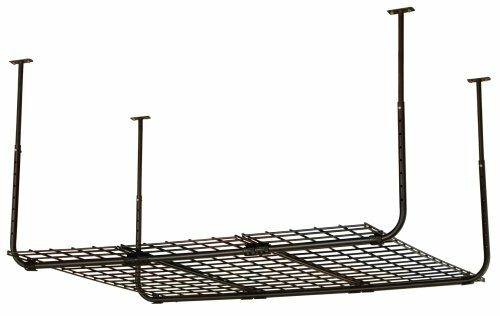 HANGING WIRE BASKET: Convenient ceiling storage rack is great for adding storage space in your garage, basement, shed, or attic! EASY ASSEMBLE: Easy to install in dry wood or directly to the wood stud for your convenience. Hardware is included. STURDY: Made with durable metal wire, this basket can hold up to 250 lbs. ADJUSTABLE: Telescoping adjustable heights from 16"-27" so you have as much storage space as you need! We hope you find this advice helpful when selecting the right ceiling storage for your garage needs. Whether you need a smaller additional storage space or something far larger than can support a heavyweight, you’ll find all the choices on the market. There are even options for different budgets and styles to so you’re sure to find a great one for your garage. When you choose a storage option, make sure that you think about the type of garage you have and the size you need. For instance, some are suitable for sloped roofs while others will not be. You also need to think about the level of weight it needs to hold. As you can see there are options for up to 600lbs all the way down to 250. Think about these questions and you will find the best overhead garage storage for your needs. Copyright © 2018, FindMoreRoom.com. All rights reserved.